Specialist musicians from all over the country will play as part of the interarts performance Saturday night of “Carmina Burana”. 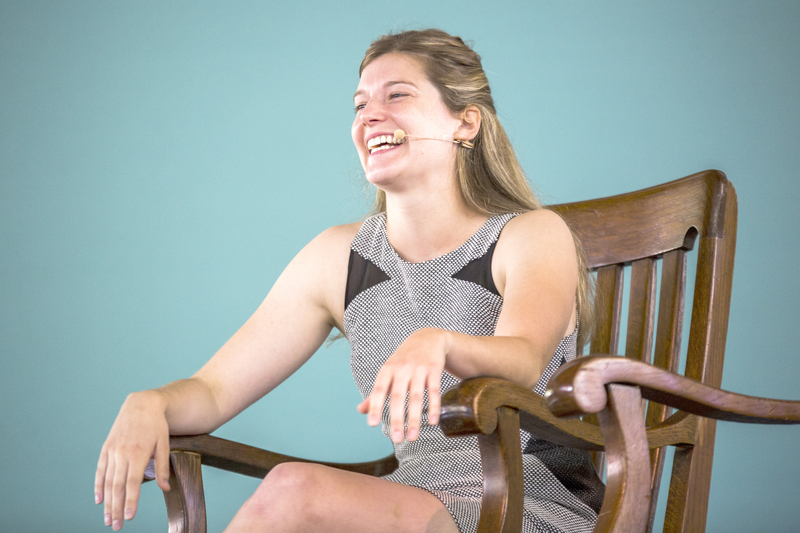 Wrapping up a week on the irrational side of human nature, behavioral economist Leslie K. John gave Chautauqua some proven methods to make everyone’s irrational natures a positive rather than a negative. Speaking at the Friday morning lecture in the Amphitheater, she focused on curbing bad habits, improving the consistency of good ones, and tricks to maintain the balance between them. Bad habits are the cause of more than 40 percent of premature deaths in the United States, putting a huge strain on healthcare and society. “This is an area where behavioral economics has a lot to contribute,” John said. Standard economics is ill-equipped to deal with these ailments because it expects people to act in their best interest, John said. Obviously, this is not always the case. Behind this approach, two strategies are typically used. One is the information provision. Another is price changes. Both have been used in the tobacco industry to curb cigarette use. But neither the information about carcinogens nor increased prices have eliminated the habit. Far too often, these two approaches backfire in the worst possible ways, John said. Information availability is incorrectly thought to be the barrier to better behaviors. For example, McDonald’s stores in New York City were mandated to label their food with nutrition facts to help consumers make healthier decisions. “If only people knew how unhealthy a Big Mac was, they would eat healthier, right?” she said. Not only did this policy result in few improvements, but associated health problems became worse in low-income neighborhoods. According to John, people became more focused on getting the most calories for their dollars. John and her colleagues conducted a study on the effectiveness of social comparison has on empowering better habits. Their study was conducted on a call center, where employees spent eight hours typically sitting sedentary. They studied the effectiveness of “walk stations,” essentially treadmills that got employees active at work, and whether they could increase use of them among the staff. One group of employees was emailed the information on their personal use of the stations while another group received information on themselves as well as their peers. John expected the effect of social comparison would raise the rates among the second group. The way that information is communicated is more important than the information itself, John said. If they had instead only emailed the information about the most successful users of the walk stations, she theorized there would have been a better result. In a follow-up survey of those who bought McDonald’s after food labels were instituted, there was a huge range of answers about how many calories were needed a day, from half a calorie to over 1 million. “People don’t know what a calorie is and have no idea what do with the information,” John said. John and her colleagues found success instead by translating the calorie information into the equitable workout necessary to burn those calories. For example, a bag of potato chips would require a 15-minute jog. Another powerful psychological tool is defaults, John said. Defaults are making the desirable behaviors the de facto response, whether through action or societal programs. In a study of policies meant to increase the amount of organ donation in select European countries, the most successful country, the Netherlands, achieved roughly 25 percent rates of organ donation through information provision. On the other hand, six countries achieved as much as 90 percent rate of organ donation by making the program opt-out instead of opt-in. As she’d discussed, the problem is not solely information but self-control and loss aversion. The goal becomes stacking the deck in favor of future desired behavior, John said. In four-month study, she focused on the effects of incentives on weight loss. She used two systems. The second system was a deposit-contract system, wherein people who get a return on their successful participation. She also engaged regret, one of the most powerful motivators of behavior, by adding a lottery incentive. Participants would be randomly selected for a monetary reward, but they would only receive it if they had taken the required steps in the study. Missing out the lottery is a powerful motivator, John said. As Dan Ariely detailed earlier in the week, regret is so powerful it can increase compliance to almost 100 percent. Both systems were successful but with a caveat: After three months, most participants had regained much of the weight they had lost. Getting behaviors to stick is the trick, John said. In order to do so, it is important to take baby steps, she advised. For example, in her own life, she developed the habit of simply getting dressed for the gym, without any intention of going. But, once she was in her gym clothes, she found it easier to convince herself to go to the gym. Another method is to engage hedonic adaptation, which is our psychological attraction to pleasurable things. When John was a graduate student at Carnegie Mellon University, she would conduct research out of the university’s research truck. To attract people for research purposes, they would often use money. However, they found a more effective motivator than money was Freezie ice pops. “People will seemingly do anything for Freezies,” she said. This tactic is called media maximization. It is similar to skee ball yielding a massive amount of tickets. While the tickets are not worth much themselves, the feeling of success and reward remains quite potent. This is because people are very sensitive to exchange rates, she said. Illustrating her point, she said one of her colleagues flew to Chicago and back simply for the airline miles. She encouraged the audience to take these concepts and apply them individually because while the idea may be worthwhile, sometimes the execution is not. Q: How do we get better at determining and responding to when behavioral economics is, in fact, being used against us? A: I think that is a hard question, because choice architecture, which is the way you set up situations essentially — it has such a powerful effect on our behavior without us even knowing it. So, I think it’s awfully hard to tell people, for example, be aware of what people are trying to do. I don’t really think that is going to work. One line of thought is if we have doctors divulge their conflict of interest to their patients. If the doctors say, “Watch out. I want you to know that I have this conflict of interest or potential ulterior motive that may bias me, so you need to take everything I say with a grain of salt.” Does that work? No, it doesn’t, and in fact, there is new research on how this actually creates a burden for patients. It actually increases their propensity to comply with what the doctor recommends because it is really awkward. So you have a doctor you presume to trust says, “I have this conflict of interest. I get paid for referring people to this clinical trial, but I think you are a really good candidate.” When the doctor divulges their conflict of interest it actually causes people to be more likely to accept the advice and to go against that advice feels like you do not trust the doctor. Q: What role does having or not having a competitive personality play into success when trying to make a change in one’s behavior? A: So, I think the role of competition is really ripe for study, and you could envision lots of different incentive systems that play off of competition. I suppose my prediction, with respect to competition, would be intuitive for those who are more competitive in nature — they will respond well, and for those of us who are not as competitive it may be a turn off. So what is an example of a competitive incentive system? Imagine we paired people who wanted to lose weight, and we had a competitive incentive, which was whoever loses more weight is the one that gets the money. Versus the cooperative incentive, if both of you lose weight, then both of you get the money, but if you neither of you lose weight, then neither of you get the money. Reciprocal incentives — which is “if I comply then my partner gets the money, and if my partner complies then I get the money.” Which I think could work particularly well for spouses — well, maybe for those happily married couples at least. Q: Does irrational behavior change with age? Do we become more rational as we gain experience, maturity and cynicism? A: By large, my intuition would be no. However — and Dan talked a little bit about this yesterday — there are some situations by getting feedback become much less overconfident for example, so sometimes there are situations where we can actually become less bias. For example, the profession meteorologist, meteorologists are actually not overconfident, at least in their weather predictions, I bet it is domain specific, and I bet in other aspects of their life, they are just as overconfident as the rest of us. But with respect to their weather forecasts, they get feedback on whether they are right or wrong. So this helps them calibrate better and make better predictions, so they are not as over confident, so feedback in that case helps. But by large, I am skeptical to whether we really do improve that much with respect to reducing our bias overtime. That’s why my thinking is taking an approach where it’s really hard to change people, so let’s change the situation so when that when we air, we air to our advantage. Q: Can information sharing be effective over time at a societal level? This person gives an example of a surgeon general’s warning on smoking. A: Well, my thinking is that, in general, it is a pretty blunt force tool to try and change people’s behavior, and if you look at cigarette labels, even the ones that are pretty evocative. In Canada, we have these labels on cigarettes that, in addition to having a verbal warning, they show horrific pictures of the consequences of having, say, mouth cancer. The evidence on whether these work, although it is difficult to evaluate their effectiveness, evidence that exists suggests they really don’t cause people to change their behavior to quit smoking. Q: How might your work be applied to help people who deal with challenging chronic illnesses and must ward off burnout when self-managing their condition? John: It’s hard. It’s a very hard question to answer. Ariely: Just to answer the complexity, one of the things we know is that the quality of caretakers lives are often, the quality of their lives are below the people with the chronic illness. So, if we think about many of the lessons from this week, I think the big part of this is to think about so immediate rewards. The fact is that people who have a chronic disease or caretakers — life doesn’t provide many moments of happiness. I think the question is: How do we increase that? If we think about the fact that we have some long-term objective that we are going towards, it’s very hard to maintain behavior this way. What if we try to find small happiness on a daily basis maybe more than once a day? I think that one of the issues would be take the goal and bring it closer, and do something that is quicker. The other thing Mike Norton mentioned was the importance of social network. When women pass away it is a very big chance that their husbands will die in the next year. Part of the reason is lack of B12 and other nutrition, but often the women are their husband’s best friends, where it doesn’t work the other way around. So, when husbands die, it doesn’t seem to accelerate anything thing, and that is because the social network for women is much more extensive. So I think if we think about immediate rewards and social networks are two very important things. John: Inherent to Dan’s response, lots of little changes need to be made, it’s not one. I think it is unrealistic to expect that there is one grand solution but behavioral economics, with this approach, we can see that it’s lots of relatively small changes we can make that can have a pretty big effect, so like a multi-pronged approach. Q: Several questions regarding working with children and how classroom teachers’ can use this info to help motivate their students. Can you provide any examples of how this has worked or not worked? John: Do you know any examples off the top of your head? Ariely: So, there is very interesting research on grit. The question basically asks: How do we get to kids to have some ability to sustain moments of unhappiness? Think about “learning to read” as an example. It is clearly not fun in the beginning, and you have to go through the drudgery of learning how to read until it becomes fun. How do you go through this process, it is a little like weight loss. You have to go through the process to get somewhere later. So the question is how do we increase self-control on one hand, and on the other hand how do we make this process by self. What I mean by “process by self” is not the kid would all of the sudden be happy they learned the letter “B” but do other things in the system that make the whole process interesting. Think about the world of games. The world of games gives people points, badges and all of those things, and we kind of have to think about how do we integrate those things into the classroom rather than doing just a rote memorization. A: So, this is where the word irrationality is tricky, because, strictly speaking, something that is irrational is a behavior that strays from a standard economic model, so it is behavior that strays for the way an economist thinks we should behave. Now, it’s a deep and philosophical question as to whether — the normative standard they have created or they think is sensible — whether that actually is sensible. So, one could argue, for example, loss aversion. Loss aversion is irrational speaking because, according to standard economic theory, the pain of losing something should be weighted equivalently to the pleasure of getting something. But why? Why should it be the same? We can even make evolutionary arguments for why loss should be more painful, so that is a bit of a dodge. I don’t have a great answer for that question. It is an excellent question and thought provoking.